On a day, we eat three major meals and two intermediary snacks. The major meals are breakfast, lunch, dinner and the intermediary ones are mid-morning snacks and tea. The first meal of the day breaks the fast during sleep after previous night’s dinner and so is called breakfast. After a fast of 8-10 hrs during sleep, the various organs of the body crave for energy and brain craves it the most. That fresh surge of energy is supplied to the brain by glucose from the first meal. Hence breakfast is popularly known as brain food. Quickens reaction time and reduces muscular fatigue. Decreases the risk of type-2 Diabetes, heart disease, high cholesterol levels and obesity. In short, regular consumption of breakfast improves overall physical and mental performance. “No man can be wise on an empty stomach”. “Hungry bellies have no ears”. “A hungry man is an angry man”. True to all these sayings, research has proved that having to function on an empty stomach undermines productivity, causes irritability and unpleasant disposition, especially during mid-morning which could be cured by just having a proper breakfast. “Eat breakfast like a king, lunch like a prince and dinner like a pauper”, so goes an adage by a famous American Nutritionist, Adelle Davis. But unfortunately, in reality many skip breakfast, eat an improper lunch and binge during dinner. The India Breakfast Habits Survey conducted by the Home Science Department of Nirmala Niketan College, Mumbai in 2013 showed that 1 in every 4 persons in India skipped breakfast. That’s alarming! Not used to eating so early. Not hungry in the morning. Would rather sleep than prepare breakfast. Get hungry sooner when breakfast is eaten. Wake up 10 min earlier. Prepare as much as you can the night before (check if you have a stock of the ingredients required, keep dishes and utensils ready, etc.). Have grab and go alternatives (fresh fruit, individual boxes of cereal, yogurt or smoothies, trail-mix). If you are not a breakfast eater, begin with something as simple as whole wheat bread toast and /or a piece of fruit. In a few days add more food. Try split-breakfast. For Eg, eat a boiled egg and leave to college or work. At the earliest break you get there, have a sandwich and drink a glass of milk or juice. Stock your kitchen with healthy breakfast options and use your imagination to cook something interesting. Most important of all, understand that breakfast skipping does not help in shedding weight. On the contrary, breakfast skippers tend to eat more during other meals and crave for fatty foods. This would only result in weight gain!!! Provide 25% of the day’s nutrient requirement, especially that of vitamins and minerals. Contain more of complex carbohydrates and fiber that are filling. Contain less of saturated fats like butter but adequate amounts of good fats like nuts and avocado. Include good quality protein like milk or egg that can supply calcium for bone building. Neither be too sugary nor too salty. Cereal with milk and fruits. Oats porridge topped with dried fruits and nuts. Breakfast bars (home-made ones prepared beforehand and stored in airtight containers) and a glass of milk. Instant Idiappam/String-hoppers with milk and jaggery. Bread toast with egg scramble or bread and egg sandwich. Dosa and chutney (If the batter has been prepared, idli, dosa and aapam are also definitely quickies; Sambhar leftover from the previous day can also be used as a side dish if you are pressed for time). Ragi porridge or multi-grain flour porridge. Bombay toast – a popular breakfast item. With a bit of prior planning and preparation, breakfast skipping can easily be avoided. So, vow not to skip breakfast; eat breakfast like a king to boost not only your brain power but also your physical power. Posted in Breakfast and tagged Breakfast, Breakfast fix, Breakfast quickies, Breakfast skipping, breakfast tips. Bookmark the permalink. 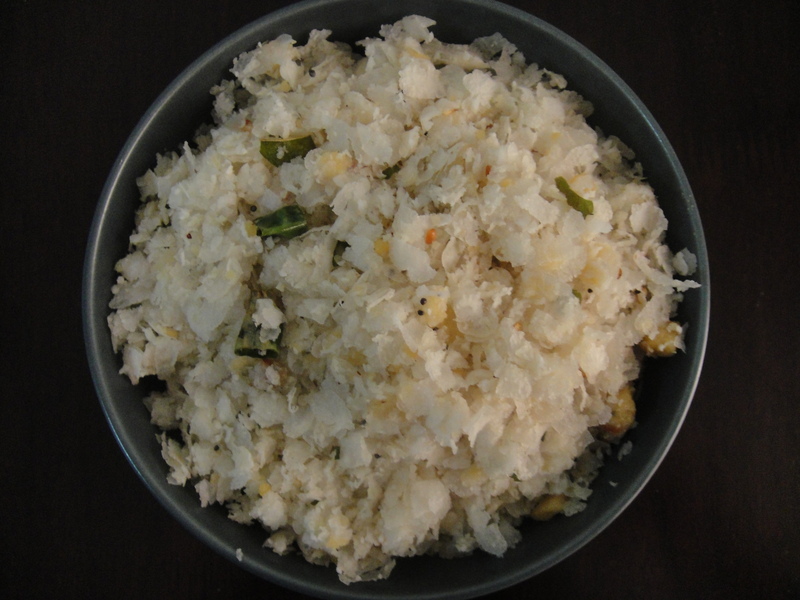 Bajil means rice flakes in Tulu (Tamil: Aval, Telugu: Atukulu, Hindi: Poha). On days when we wake up at a time too late for breakfast but too early for lunch, we rattle our brains to think of an appropriate dish to cook – something that is light, easy and quick to prepare, that would sustain us for an hour or two and let us have our lunch at our usual timing. It was during one such occasion that I learnt about this Mangalorean delicacy from my husband. Having spent part of his student life in Mangalore, he had grown to love its culture and cuisine. Take about 2 cups of the thin variety of rice flakes. Sprinkle only a very small quantity of water on the rice flakes (to soften them) lest they will become soggy. Add about 1-2 tbsp of powdered jaggery. Add 3 tbsp of freshly grated coconut. Add 1 tsp of refined oil to a shallow pan and heat it. Once ready, add 1 tsp of mustard seeds and allow them to splutter. Follow with the addition of 1 tsp of blackgram dhal, 1 chopped green chili and a few curry leaves. Now add the tempering to the rice flakes and mix all ingredients. Breakfast is ready in a jiffy. Isn’t simple? The hot and sweet combo of this dish was a welcome change to the stereotypical exclusively sweet or hot foods that we regularly ate. I just could not stop with one helping and reached out for more. It is true that a dish does not require a long list of ingredients or elaborate cooking to taste good. Bajil is indeed a perfect quick fix for breakfast. This dish is usually served as an accompaniment with chickpeas gravy and together they are called as Kadle Bajil. Since we came up with the idea of making bajil suddenly, we had to forgo the chickpeas part of it. But if you have a prior plan of doing it, you could soak some chickpeas overnight, pressure cook with required amount of salt and make gravy by adding few other veggies-this traditional way of eating it calls for the preparation of two dishes. If you deviate a little from the normal way and put the cooked chickpeas (after draining the water) directly to the rice flakes mixture, you get a wholesome one dish meal. If any of you has tasted this dish before, feel free to share your opinions and tips. Posted in Breakfast, Quick Breakfast Fix and tagged Atukulu, Aval, Bajil, Breakfast, Mangalorean delicacy, One dish meal, Poha, Rice flakes. Bookmark the permalink.